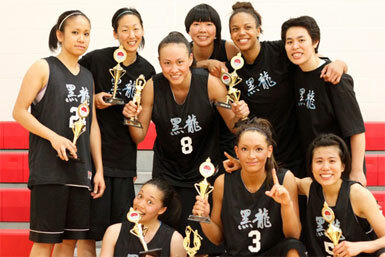 Toronto Black Dragons Capture First Chip - How Sweet It Is! Following a full slate of a dozen games on Saturday, all 8 Women’s Open teams were seeded for the single elimination Playoff Round beginning on Sunday morning. Earning the all important top seeds with identical 3-0 records would be the two home teams- the Toronto CCYAA Women, and the Toronto Black Dragons. This year, 5 of the 8 teams had reasonable expectations that they would be able to reach the Final Four- the two aforementioned TO squads, the youthful and talented Washington CYC China Dolls, the dynastic LA Aiya team, and of course the 2-time defending Chip winners, the SF ArcAngels. Bright and early Sunday morning, the first Elite Eight game would feature a battle of local talent when 3-0 CCYAA (2008, 2009 Womens Open Runners Up) would face the 0-3 Toronto Blackoi (2008 Liberty Champs). CCYAA went to swingman Elspeth Cheng (8 pts) early on and finished up with a sick Christine Vuong (18 pts) highlight show as she went coast to coast for a sweet baby finger roll, swished a deep trifecta, and sank a few short jumpers. CCYAA advanced easily, 43-25. The Blackoi were paced by Anne Pastrana & her baker’s dozen. Up next, the SF ArcAngels were playing an early EST game against the NY Force that was way too early for their PST Circadian Rhythms. SF’s sluggish feet were evident at the beginning of the game as it took them almost 14-15 minutes to really pull away and get a healthy cushion. Guards Jen Sze (9 pts, 2 treys) and Kathleen Ty (11 pts, 2 triples) finally got the ArcAngels into the realm of the double digit lead as they led 22-9 halfway in. SF never looked back as they breezed through the rest of the game 46-31. Twin towers Nicole Lem (8 pts) and Cadie Chu (11 pts, All-Tourney) led the young Force. The next QF game between the Toronto Black Dragons and the NY Sabres Black tipped off shortly after the Frisco game and there was no mistake about who was the favored team here. The Black Dragons came out ablaze as they torched the York University gymnasium with close to 75% FG shooting in the first half. The Black Dragons gave the Sabres no hope of a comeback as they dominated both ends of the floor and swooped in gracefully for all the rebounds. The halftime score was 32-6 in favor of Toronto. They shared the rock unselfishly as all of their players got into the scoring column. Sabrina Cheng (6 pts) provided the Sabres with a spark in the second half but it wasn’t nearly enough as the Black Dragons dominated this one 67-17. 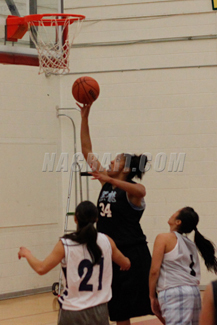 Angie Leung had 12 and Niveal Pastrana had 16 for the TBD’s. The final game of the round looked to be the most pivotal matchup. The Washington CYC China Dolls and wily Coach John Chin would need to keep the pace up, be the aggressor, and play solid halfcourt D as they faced the battle tested LA Aiya. But it turned out that LA Coach CarolJue had quite a gameplan of her own that the experienced Aiya team was able to execute almost flawlessly. On offense, LA set multiple off the ballscreens against the scrambling China Dolls and swung the ball around the hardwood like clockwork as SGJessica Liang and PG Alice Wang found themselves with wide open looks. On defense, LA was physical as they pounded on the younger CYC girls on the perimeter and swarmed NACBA Top 10’er Kalyn Lee every time she got her paws on the rock. A few foul calls didn’t worry Aiya, as their ultra deep bench gave them the confidence to just stay focused on the nitty gritty. LA was able to go up by 15 points and they looked like they were headed towards easy street. As the game moved on, the China Dolls mustered up one last ran as Kalyn Lee (9 pts) dropped in some timely buckets and Michelle Chan had a block party on her birthday to slice the deficit to a few. But ageless wonder Debbie Young hit a clutch shot, Vickie Sill converted an old fashioned 3-point play, and Kristen Welsh popped a bunch of freethrows as the lead went back to double digits. LA reached the Final Four yet again with a 48-33 W, and DC would remain a team on the verge of breaking through. The first semifinal game would be a big one, as the Toronto CCYAA Women were scheduled to meet the SF ArcAngels in a rematch of the 2008 & 2009 Championship games. The crowd was giddy with anticipation to check this one out. 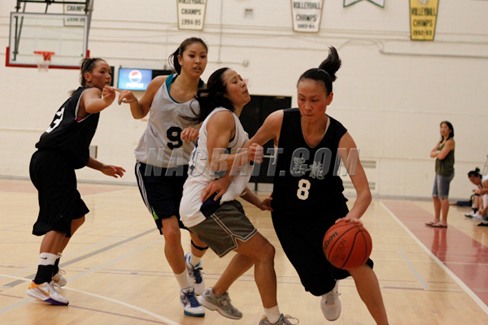 CCYAA would once again roll out a star studded lineup featuring NACBA Top 10 MOP Cecilia Chan (2006 MVP), 2008 All-NACBA swingman Elspeth Cheng, 2009 All-NACBA F Fiona Cheng, and 2010 All-NACBA G Christine Vuong. 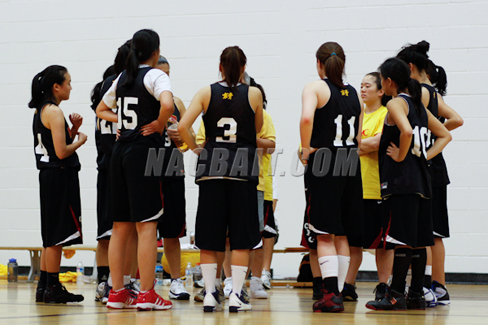 Supporting roles would be played by young lanky SF Tori Lee and 2010 Pre-NACBAIT MVP Janice Lui. San Fran would check in with UCLA Bruin Kelly Tiao (2008 MVP, NACBA Top 10), 2009 MVP Tracy Tiao, and a quartet of All-NACBA G’s in Angie Wong, Kathleen Ty, Irene Wong, and Jen Sze. With added help from athletic Melanie Wong and vet Celina Chow, SF was ready for anything. This game was too good to be a Semifinal matchup with these stacked lineups. CCYAA began well, especially at the defensive end, by getting back on defense and contesting the ArcAngel jumpshots every time. On offense, it was the big guns of CC (7 first half points, 10 overall) and Elspeth Cheng (5 pts) who were delivering for Toronto. If it weren’t for some missed free throws, CCYAA might have been up by double digits at the half. New pickup Lena Wu (6 first half points) kept the ArcAngels in contention by cleaning up underneath. Toronto was up 20-16 at the half. In the second half, the tide turned big time. All-NACBA pick Jen Sze (15 pts, 4 triples, 3-4 ft) was in her own little world and Toronto managed on 3 buckets after the half. CCYAA stayed aggressive and kept getting to the stripe, but for some reason they kept going 1 for 2. The lead disappeared quickly and soon the ArcAngels pulled away for a 40-33 win. The second semifinal match turned out to be one of the most exciting games of the tournament and definitely the loudest as the Toronto Black Dragons and LA Aiya would meet up. LA definitely held the edge in intangible qualities here, as they had never lost to the Dragons in their 10 years on the NACBA circuit. But this was a new Dragons squad, which got younger and more swagged out with the additions of Rachel Niven, Kim Lee, and Gillian Maxwell. Niven (2009 OCAA Player of the Year) and Lee (2010 CCAA Player of the Year) both bring big time credentials as the top Collegiate basketball players in all of Canada. But a standout team like Aiya would not be intimidated by a faster, more athletic team like the TBD’s. Kristen Welsh (10 first half points) and Jessica Liang (NCAA D-2 All American herself, 15 pts) raised their games to the next level as they matched Lee (7 first half points), Niven (7 first half points), and Angie Leung (St. John’s, NACBA Top 10, 11 pts, 3 treys) shot for shot. At the half, the score was knotted at 26 and the York U grandstands were abuzz with guesses about what would happen in the second 20 minutes. As quite a few of the locals predicted, Kim Lee (20 pts, 3 triples) went on a tear. At 5-10, she shoots the basketball with uncommon range and doesn’t need to worry about trying to get her shot off. She dropping in big bucket time and time again as the Black Dragons pulled away to what looked like an insurmountable 12 point lead. One thing the doubters learned this weekend was to never count out the hardnosed LA Aiya’s. Trailing by double digits in the last minute and a half, LA kept trading 1 and 1 free throws by Toronto for long range 3-point attempts. The Aiyas (Allison Welsh, Alice Wang, Jessica Liang) nailed 5 of 7 trifectas (with a couple of long offensive rebounds mixed in) during the last minute, from as far as 27-28 feet away to get the crowd roaring. The lead was down to 3 points and no one had ever seen anything like this before in such a big game. The Black Dragons eventually sank 4 free throws to win 60-53, but this was easily one of the most impressive losing efforts in the Tournament as LA refused to give up. 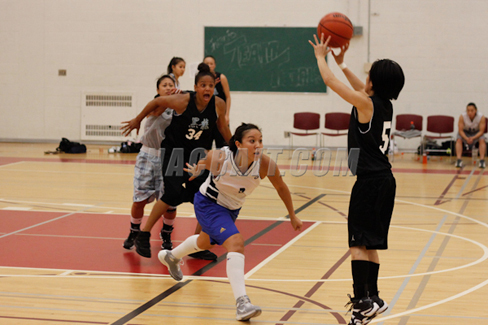 Rachel Niven had 20 pts, 6 rebounds, and 1 steal for Toronto. Monday’s Championship game between the Toronto Black Dragons and the SF ArcAngels came down to probably what were the 2 most athletic and talented teams in the tournament. Not that these teams didn’t also have great chemistry, but both Toronto CCYAA and LA Aiya are clubs that pride themselves on teamwork, stability, and continuity in their lineups. So it was somewhat shocking that neither CCYAA nor LA reached the finals. SF started the game with a lineup of 2008 MVP Tracy Tiao & 2009 MVP Kelly Tiao at forward, and a trio of All-NACBA picks in Shorty Ty, Angie Wong, and Jennifer Sze in the backcourt. They were missing frontcourt gazelle and 2009 All-NACBA selection Lulue Burton this weekend, and she would be dearly missed on the boards, in transition, and on the defensive end against the taller Black Dragons. The Black Dragons rolled out a starting lineup full of Canadian superstars, the likes of which we haven’t seen previously. With Rachel Niven (OCAA Player of the Year) at the point, ageless wonder Angie Leung (NACBA Top 10) would shift over to the 2-guard. 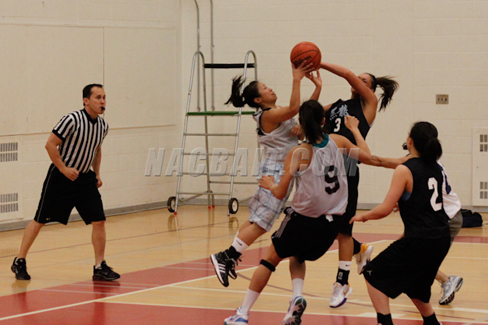 Kim Lee (CCAA Player of the Year) was a dominant force at the 3, averaging 20.5 ppg throughout the weekend. At power forward, Lee Anne Chong (All-NACBA) could really stretch the floor with her high percentage shooting and in the post, 5-11 Gillian Maxwell (Waterloo University, OUA’s 2nd All Time leading rebounder) would be pretty tough to matchup with for anyone. These starting lineups would certainly give almost any college/university team a run for the money, so there was a lot of anticipation to see what would happen once the opening tip was tossed. In the first half, Shorty Ty (3/4 FG in the half) and Jen Sze (4/6 FG, 2/3 Treys in the half) were pretty much able to pick their spots for good looks in the halfcourt and on secondary breaks as SF was looking like they might be able to pull the threepeat. Kim Lee started off by missing her first 3 shots, and Gillian Maxwell was also struggling from the field, going 2-9 in the first half. But Toronto didn’t cave in to the pressure as they started to take it to the cup a little bit more (11/14 first half FT’s). Once they started getting some easy points from the stripe, the offense started to flow and Kim hit 3 triples, including an amazing 4 point play right before the half that shifted all the momentum the Dragons’ way. At the half, Toronto was leading 30-25. At halftime, the ArcAngels knew they would have to make some changes defensively and in the second half they really got into Kimberly Lee’s comfort zone as they continually got the ball out of her hands to make someone else beat them. Rachel Niven was more than up to the challenge, sinking 4 of 5 FG’s in the second half. G Amanda Lum (Univ. Toronto) also came off the bench to nail all 3 of her attempts to give the Black Dragons a bit of a turbo booster. San Francisco went cold at the wrong time, but were able to stay within striking distance by hitting the offensive glass and pulling down 14 O-Rebs. A couple of three-pointers by Cel Chow and Kelly Tiao made it a game, but Torontowas clutch when it counted as they made their free throws as the clock wound down. After Tracy Tiao and Angie Wong fouled out for SF, Toronto was able to hold on for the 64-57 victory and their first ever NACBA Title. MVP Kimberly Lee had 23 points, 3 triples, 2 blocks, and 4 rebounds. 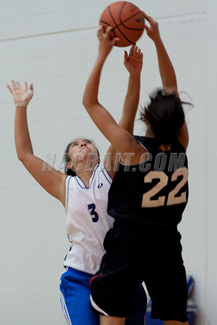 Jennifer Sze had 16 points, 5 rebs, 2 dimes, and 3 treyballs for SFAA, while teammate Kelly Tiao had 12 pts and 9 caroms. Great job to the Black Dragons, and congrats to longtime vets Danby Wong, Lee Anne Chong, and Angie Leung on their first title wins. Watch as the Black Dragons go for the repeat in Boston!